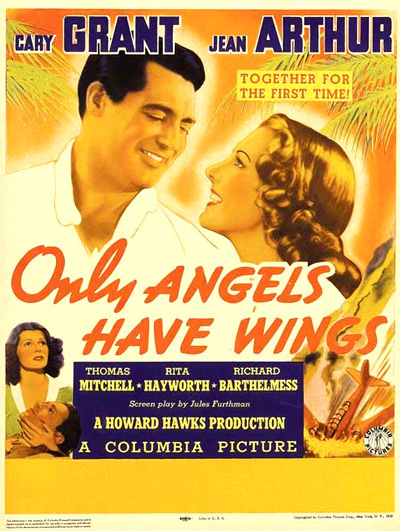 Only Angels Have Wings (1939) is a quintessential adventure-aviation film with drama, dark fatalism, suspense and romance that is stocked with true-to-life sequences, fast-paced action and top stars in skillfully-executed roles. The film's themes include male camaraderie and loyalty, professionalism, courage and duty in the face of life-and-death perils and dangers, and rugged, stoic bravery - the pilots' code. A group of courier-aviators in a mythical outpost in South America (in a confined, tropical area centered around a kindly Dutchman's bar), led by the flinty and often unlikeably rude "Papa" (Cary Grant), face hazards and mortality every day as they fly over fog-shrouded Andes mountains to deliver the mail within a banana republic. One of the film's poster claimed: "ROMANCE SOARING ABOVE THE ANDES! DRAMA THUNDERING ACROSS A CONTINENT!" Producer, director, and writer Howard Hawks wrote an original short story titled "Plane Four from Barranca" in 1938 and then had screenwriter Jules Furthman create the screenplay [Note: William Rankin and Eleanore Griffin are uncredited writers] - to take advantage of the availability of Cary Grant and Jean Arthur at Columbia Studios. After Grant's success in Gunga Din (1939), this was the actor's 33rd film in a career stretching back seven years. And this was the second of five films that Grant made with Hawks - their sole adventure film among four other screwball comedies (Bringing Up Baby (1938), His Girl Friday (1940), I Was a Male War Bride (1949), and Monkey Business (1952). The well-directed film, originally titled Pilot Number 4, was based upon and recalled Hawks' previous aviation films - The Dawn Patrol (1930), Ceiling Zero (1936), and other films of the 30s: John Ford's Airmail (1932), Night Flight (1933), Flight From Glory (1937) and director Edmund Goulding's remake The Dawn Patrol (1938) with Errol Flynn. Only Angels Have Wings mirrored a very successful plot element of other adventure/romance pictures of the 30s (Red Dust (1932), China Seas (1935) and Torrid Zone (1940)) - the idea of an independent woman invading an all-male, small environment and community. Hawks reprised this thematic element in To Have and Have Not (1944) with Lauren Bacall and Humphrey Bogart. Silent film star Richard Barthelmess (who had appeared in D.W. Griffith's Broken Blossoms (1919) and Way Down East (1920)) returned to the screen in a comeback attempt after a three-year absence in the role of an ostracized and disgraced ace-flier (responsible in the past for causing the death of another aviator) who redeems and vindicates himself by flying on a dangerous mission. [Barthelmess also appeared in the lead role in Hawks' first successful flying movie and first talkie, The Dawn Patrol (1930).] Reddish-haired, inexperienced Rita Hayworth (birthname: Margarita Cansino) made her most important film appearance to date as Grant's "no-good" ex-wife. And star Thomas Mitchell appeared in at least four other great films in the same year: in Ford's Stagecoach (1939), Mr. Smith Goes to Washington (1939) (with co-star Jean Arthur! ), Gone With the Wind (1939), and The Hunchback of Notre Dame (1939). The film received only two Academy Awards nominations without winning any Oscars: Best B/W Cinematography (Joseph Walker) in preliminary balloting, and Best Special Effects (Roy Davidson and Edwin C. Hahn). The film, shot in Los Angeles, was significant for being one of the first to receive an Oscar nomination for Special Effects - a category recognized for the first time. Port of call for the South American banana boats. Two handsome and amiable American air-mail fliers, Les Peters (Allyn Joslyn) (from New York) and Joe Souther (Noah Berry, Jr.) (from Kansas) collect two sacks of mail from the boat's purser Rafael and inquire about female prospects among the tourist passengers. A pretty American blonde with a tight-fitting suit disembarks (for the stop-over until 4:00 am), parades down the gangplank, and catches their eye - they pursue her to a nearby cafe. She stands at the doorway looking in at locals dancing and singing "Chick-a-chee." Although a foreigner, she attempts to cheerfully sing along with the refrain. Outside, she is delightfully pleased to learn that the on-the-make guys are Americans. She surprises them by striking up an acquaintance with her two fellow countrymen: "Sure sounds good to hear something that doesn't sound like pig latin" - she introduces herself as Bonnie Lee (Jean Arthur) "from Brooklyn." The two fliers, while both making a play for Bonnie Lee, take her to their place of work for a drink - a flying service owned [for the previous year and a half] by John Vanrider, a Dutchman affectionately named "Dutchy" (Sig Rumann) ("the postmaster and leading banker of Barranca") - the restaurant that he also owns is a combination saloon, general store, hotel, gathering place, and airlines headquarters for Barranca Airways. They describe their work: "We fly a little mail and things here and there," and they toast their drinks with "Happy Landings!" Bonnie Lee is unemployed and on her way home, unless she gets a job in Panama as a showgirl: "I quit a show at Valparaiso." I'll be glad to take up where you left off. Bonnie: Now look here, mister. I've got something to say about this, you know. Bonnie: No, I do a specialty. Bonnie: Oh, it's the most wonderful thing I've ever seen. Geoff: Yes. Reminded you of a great big beautiful bird, didn't it? Bonnie: No, it didn't at all. That's why it's so wonderful. It's really a flying human being. Geoff: Well, you're right about one thing. A bird would have too much sense to fly in that kind of muck. The pass quickly closes in and becomes enshrouded enroute ("a heavy fog bank"), noticed by Kid Dabb (Thomas Mitchell), another of the older, daredevil pilots. Joe is forced to turn back and make a risky landing - he is determined to share a steak with Bonnie that evening: "You tell that beautiful blonde I'm still in the running." Kid's affection for Geoff is illustrated by the gesture of taking his jacket outside to him near the cold airfield and draping it over his shoulders. To allow better concentration, Geoff orders the piano player to stop playing Turkey in the Straw in the saloon. [First attempt] On top of the fog at 1500...Flying at 1500 due east...Here I come, 1200...A thousand. Eight hundred, six hundred... [Second attempt] Here I come, six hundred...five hundred, four hundred...three hundred...I'm down to 100 now, Geoff...(He narrowly misses crashing) I saw the lights, I'll get it next time... [Third attempt] Give me one more chance. I think I see a hole. Yeah, I do see one. I'm comin' down, Geoff...It's all right, Geoff, I see the lights. I'll make it easy. Kid Dabb: Well, you did all you could. Geoff: Yeah. Mr. Wise Guy. Bonnie: Oh, do something, do something. He may be alive! Don't just stand there! Geoff: Cut it out. Pull yourself together. Haven't you caused enough trouble? Joe, you crazy fool! Nobody could tell you anything. You knew it all, huh? Well, it serves you right. I don't feel sorry for you. Not a bit. No skin off my nose. If you can take it, I can. Geoff: In about a week, you'll either collect or lose your shirt. Dutchy: Oh, I'm not thinking about that. I just can't go on killing nice kids like that, not if I lose a dozen shirts! Geoff: You think you're the only one that feels that way? Dutchy: Then why do you send them up for in that kind of weather? Geoff: Because I'm running an airline and I'm not running it any different than anybody I ever flew for...Joe died flying, didn't he? That was his job. He just wasn't good enough. That's why he got it. Dutchy: I ain't built like you are, Geoff. I shouldn't be in such a business. We can't go on like that...Oh, Geoff! You're a hard man, much too hard. Geoff: Cut it out...Cut it out!..What's the use of feeling bad about something that couldn't be helped?...I told you, Joe just wasn't good enough. If he hadn't got it tonight, he was bound to get it sooner or later. Dutchy: Then you had no business to let him fly. Geoff: What, ground that kid? Say, he'd sooner be where he is than quit. Sure it was your fault. You were gonna have dinner with him, the Dutchman hired him, I sent him up on schedule, the fog came in, a tree got in the way. All your fault. Forget it, unless you want the honor. Bonnie: How can you do that? Geoff: What's the matter with it? Geoff: Look, what do you want me to do? Have it stuffed? Bonnie: Haven't you any feelings? Don't you realize he's dead? And all the weeping and wailing in the world won't make him any deader 20 years from now. If you feel like bawling, how do you think we feel? Bonnie: All my life, I've hated funerals. The fuss and bother never brings anybody back. It just spoils remembering them as they really are. And when I see people actually facing it that way, I have to act like a sap. This flying business is new to me. Sparks: You have to have some crazy way of looking at it to go on. Bonnie: Does this sort of thing happen very often? Sparks: Well, that depends on weather and luck. Sparks: Not much future in that, either. Bonnie: Yes, we found that out. Bonnie: Never heard of him.